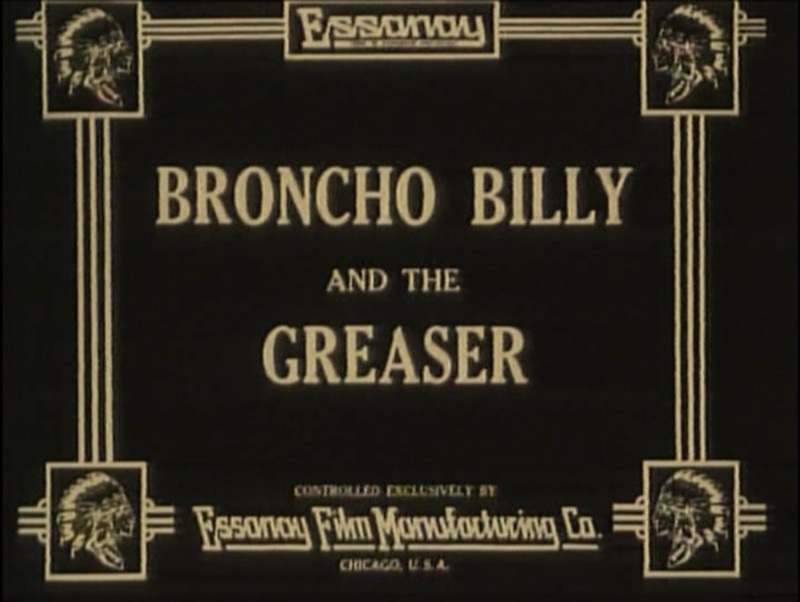 This is probably one of the most “typical” Western shorts I’ve seen from Gilbert M. “Broncho Billy” Anderson, in the sense that it could most effortlessly be substituted for the kind of kids’ Western fare of later eras of movies and television. Broncho Billy delivers mail by horseback, and when he rides into town he quickly greets Marguerite Clayton, apparently the only single young lady for miles around, before going into the General Store that serves as a local post office. The postmaster there is dealing with the impatience of locals who seem to have little to do but hang around the store asking him when the mail’s coming in, but he’s happy to fill Marguerite’s jug while they wait. Meanwhile, a local “half-breed,” played by Lee Willard, has been making better (or worse) use of his time at the local saloon. He saunters in just after Billy delivers the mail, blustering his way to the head of the line by displaying his six-shooter. Billy, made aware of the situation by the post master, corrects the situation by drawing his gun and escorting the bad guy out of the store. Once she has her mail, Marguerite shows her appreciation with a chaste handshake that makes both of them ride their horses backwards. The villain, of course, observes all of this with glares. Lee now gives us a performance, showing off how enraged he is, riding back to his shack and drinking from a flask, snarling at the camera. He watches as Billy rides past his shack and picks up a knife, showing us what is in his mind with slashing gestures, then gets on his horse and follows. Billy stops on the road to help a man who seems to be suffering from thirst and exhaustion, stumbling down the road and trying to drink from a stream. Lee goes into a bar to get more liquor, but is treated with suspicion by the proprietor, who demands money up front. This only raises his ire, and now he pursues Billy (and his invalid discovery) back to his shack, where Billy has put the man to bed and started a pot of coffee, before taking off his own bracers and laying down for a snooze. Lee peeks into the window and sees Billy asleep, but at this moment Marguerite rides up and sees what is afoot, hastily jumping on her horse for help after the devious Mexican enters Billy’s shack without knocking. Billy fights, but Lee is able to tie him up. So, Marguerite makes her way to the Lazy X ranch, where a dance is taking place, and calls on the men to help. The invalid tries to do something, but barely manages to fall out of bed. The men from the ranch ride to the rescue while Billy struggles to keep the knife away. Once there, they grab the bad guy and drag him away, barely pausing long enough to untie Billy, who now returns to helping the old man. Marguerite comes in and makes sure Billy is OK, before they again shake hands shyly. The obvious thing to comment about in this film is the racist portrayal of a “half-breed” or “greaser” villain. There are no surprises here, and certainly no subversion of American racial hierarchies, but it’s interesting to note two things: First, much of the story is told from Lee’s point of view, and he may actually get more screen time than Billy. Second, for all of the villain’s apparent evil intentions, he in no way menaces the white virginal woman, as played by Marguerite Clayton. One could argue that this threat is implicit, inasmuch as Billy’s closeness to the girl seems to be what sets him off, but it is Billy that he acts out against. Even there, he’s decent enough (or drunk enough) to wake Billy up and tie him rather than simply slitting his throat while he sleeps – although really this is a contrivance to give the girl a chance to go for help. 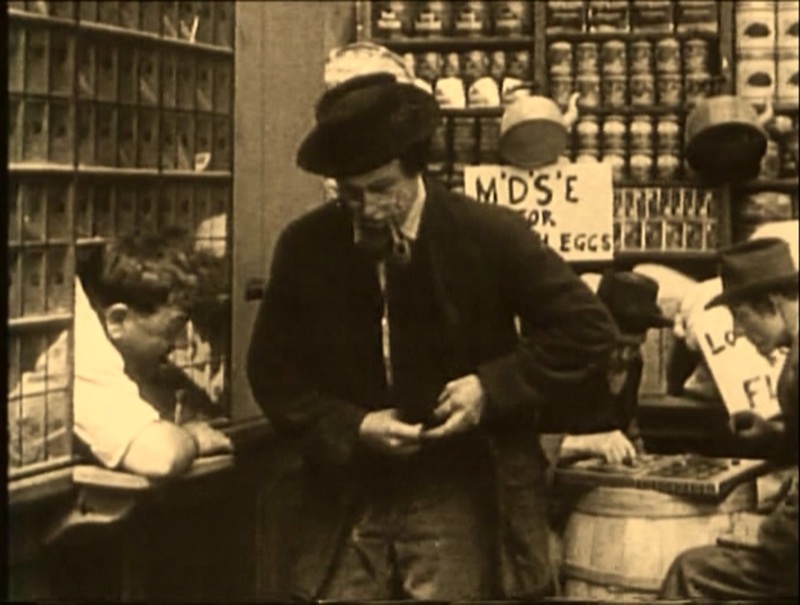 It’s also noteworthy that Billy’s sole “heroic” act against him is to point a gun at him in the general store. If the other (white) townspeople had not come to his rescue, Billy would not have had the strength to defeat his foe alone. Billy is a gentleman toward the girl, and tries to help a wounded man, so we know he’s “good,” but he doesn’t manage to save the day. One more thing I’ve been meaning to comment on is an odd bit of fashion that I mentioned briefly above – the bracers or wrist guards that all of the cowboys wear in these early Westerns. It’s universal in Essanay films, and common from what I recall in Ince pictures and in the few early Westerns of Douglas Fairbanks that I’ve seen. But, if you look at a later Western (I watched “Once Upon a Time in the West” the other night, and kept an eye out, for example), they have been abandoned. Wikipedia only lists these items as protectors for archers, but I can imagine cowboys using them to avoid chafing their wrists with rope or reins. 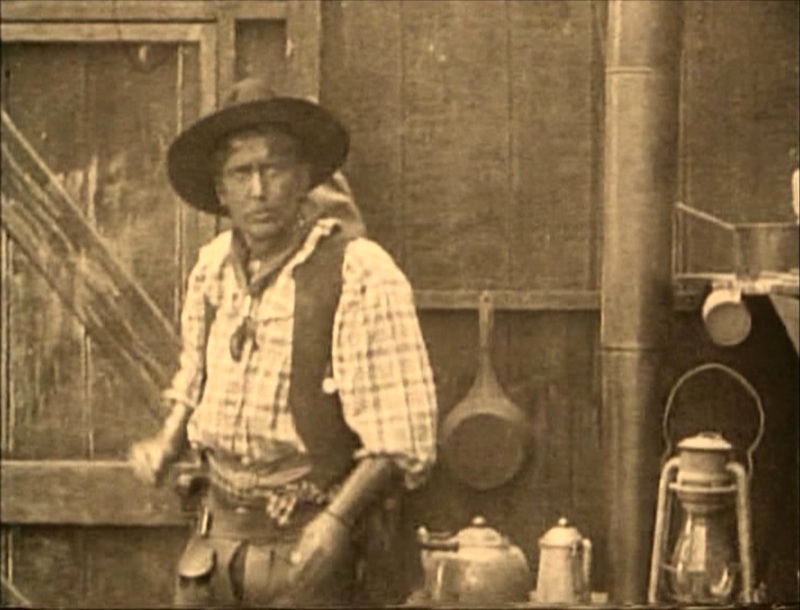 To me, it kind of gives these early cowboy actors a Heavy Metal look (although theirs aren’t studded or spiked), and it feels somewhat more authentic than later movie fashion, but I’m no expert here.